Since the past Friday, the weekend publications and newsletters are aloft with praises for a Alibaba that went for an IPO at NYSE that raised a whopping 22 billion dollars, with 271 million shares that were sold like hot dogs in a matter of just 20 minutes of it’s opening at $92.70 (Face value/share= $68). With those figures, Alibaba IPO is the Wall Street’s or rather the world’s biggest IPO ever! One might surely recall the excitement the Facebook IPO caused, but in the May debut, Facebook’s IPO price was $38 and the stock had depreciated by almost 50% in 4 months after the IPO. So Alibaba’s IPO is a remarkable one in the history of the tech and trading world. Wow! That’s huge. So what does Alibaba do that people are flocking to get it’s share, you ask. Jack Ma, in his early days was earning just $15 pm as an English teacher, who also flunked math and college entrance exams, now features as the richest man in China. 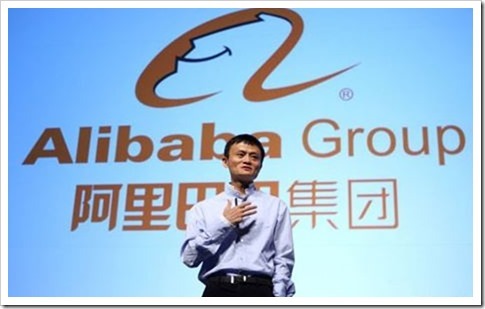 After little luck in jobs, he started Alibaba in 1999 from his apartment. He and his wife with few other friends pitched in their life savings, started the e-commerce company with a modest 18 employees. Alibaba processes countless business transactions everyday by generating $284 billion transactions last year (Comparatively, ebay generated only $83 billion). Must mean the profits are huge. Yes, the recent quarter it made about $2 billion in profit while Amazon suffered losses of $126 million.Most of Alibaba’s revenues comes from advertising or commissions. So that explains why people are dying to get a piece of the cake. Almost 60% of the packages delivered in China are sent through Alibaba sites. It handles 80% of the e-commerce in China, which is larger than ebay and Amazon put together in the US. So what do the Americans care about this Chinese giant, we may think. Investors are gaga over Alibaba because the giant now seems to be US bound and has taken a strong landing in many mobile and ecommerce US startups. It shelled out $215 million on a messaging app American company Tango. It also invested part of $250 million in Lyft with Andreessen Horowitz. Alibaba funded Fanatics, an online sports retailer. It also took over a directorial seat in a video game startup Kabam. The company still has many startups undisclosed in it’s kitty. Keeping an watchful eye on profitable startups, the Chinese e-commerce dragon seems to be depleting it’s billion profits in potential startups only to gain more of the green stuff. That’s like investing profits for greater profits and mostly for control. That’s a dangerous strategy but if played right, it can establish Alibaba as the biggest e-commerce conglomerate. It also launched 11Main, an e-commerce platform for high goods like jewellery, clothing etc. In present day China, many villages purely make their living on the business derived from Alibaba sites. From anything as small as plant seeds to as big as a car, Alibaba gives even the not-so-tech-savvy citizens to transact everyday business and converting each village into Taobao villages. Being called the Amazon of China, the mastermind Jack Ma is a ruthless business man who once preached to his staff about surpassing the Silicon Valley talent. Barely knows to code, Ma’s business acumen are fit to land in as a chapter in the B-school text books. Rumour has it that he gave Ebay’s Eachnet a run for their money in China and successfully drove them out of competition establishing a monopoly. He exercises incredible power in his companies with a questionable stake that doesn’t call for power. Unlike many corporations wherein the directors have their say proportionate to their stake held in the acquired company, Jack Ma defies that rule. A group of trustworthy old employees of Alibaba form a directorship board called the Alibaba Partnership that decides the fate of it’s companies under the main flagship. This partnership was rejected by the Hong Kong Stock Exchange on account of it’s aggressive business approach, so naturally Alibaba turned towards the Wall Street. With most of it’s products landing in the Americas, NYSE seemed to be the best option. Citing Alibaba’s potential, Yahoo owned 1/5th of it’s share back in 2005 and Jerry Yang couldn’t be more happy for selecting Alibaba to invest in when it sells more than 120million shares during the IPO. Yahoo has a stake of 16.3% even after the IPO. Softbank, a Japanese tech firm that owns Sprint, is the biggest shareholder with 32.4% stake. As mentioned earlier, Ma’s influence on Alibaba is more than Yahoo and Softbank. Inspired by the age old story “Alibaba and the 40 theives”, where the protagonist Alibaba finds unmatchable treasure behind the walls of a cave, Ma named his venture Alibaba. Staying true to the name, Alibaba has opened up riches that the investors have their eye on. “After all we’re not a company from China, we are an internet company that happens to be in China” says Jack Ma, whose visions for Alibaba have new frontiers!